Chennai certainly does love animals, and especially reptile at that! This is depicting in the fact that city along with its crocodile park also has a snake park! Might creep out anyone who loathes all the crawling creatures. But for those who don’t, this place can in fact be very enlightening. The Chennai Snake Park is an attraction initiated by a herpetologist Romulus Whitaker, in the year 1972. 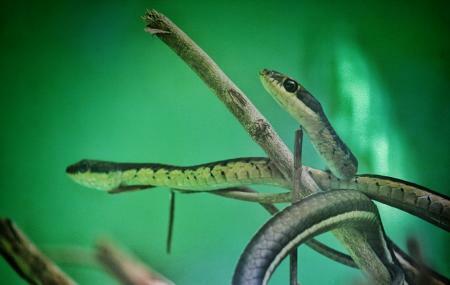 It boasts of the title of being “India's first reptile park”. On your visit here look forward to seeing a variety of snakes in the form of pythons, adders, cobras, vipers, and other reptiles. How popular is Chennai Snake Park? People normally also visit San Thome Basilica while planning their trip to Chennai Snake Park. A very unique place to explore and test your knowledge of the reptiles mainly the snakes. Such variety of poisonous and non poisonous snakes. Nothing like watching them alive. There is also a museum of many different specimens of reptiles , life size models of some. Go on enjoy the tour. Good place for a one time visit with kids. Its pretty shady so not a concern when you go. They have a decent collection of reptiles with pretty informative boards. Interesting exhibits include a fat python (like pretty fat), a huge bunch of crocodiles and they also have a live show of few snakes where in one of they employees shows the live snakes in a huge glass chambers. Its one of the best time to spend weekends in Chennai with friends and family. Had a lot of snakes, crocodiles, tortoises, birds, and animals also. It also has a lot of locations to take nice pics. Lot of buses are available to the park and near to IITM. The place is cleanly maintained. It has got most of the snakes found in India. There was a very large reticulated python. It's had other creepers also like crocodiles, alligators, tortoise and my favourite chameleon. It has got a small museum also and if you're lucky then you can witness the snake show. this place has almost all the popular snakes( no rattle snake 😬) that one must know about. here you will find other reptile species too, such as lizards, iguanas, crocodiles etc. Various species of tortoise and turtle are also here. overall it's a good place for children as well as teenagers to give a brief glimpse of reptiles.